However I did have quite good night last week with a variety of results across various systems. I've been experimenting with 25mm and a couple of 50mm lenses. Heres a short video is the various meteors. Watec WAT-910HX camera + 6mm F0.95 lens + ThorLabs 830 l/mm 50x50mm transmission grating. Please, prompt me, it's a good choice? The lens especially interests. The focal length and what it has to be is how important? Whether it is necessary to increase focal length? Or, perhaps, to leave focal length former but to increase grating lines number to 1200 l/mm? For general imaging you'll get great results with the 6mm lens. However for spectroscopy it is better to have a longer focal length as it gives a larger image scale. You'll see all of my observations are done with 12mm lenses. Using a higher line count gives greater dispersion but also fainter images. 600lines/mm or 830lines/mm give the best results with video type systems on average. 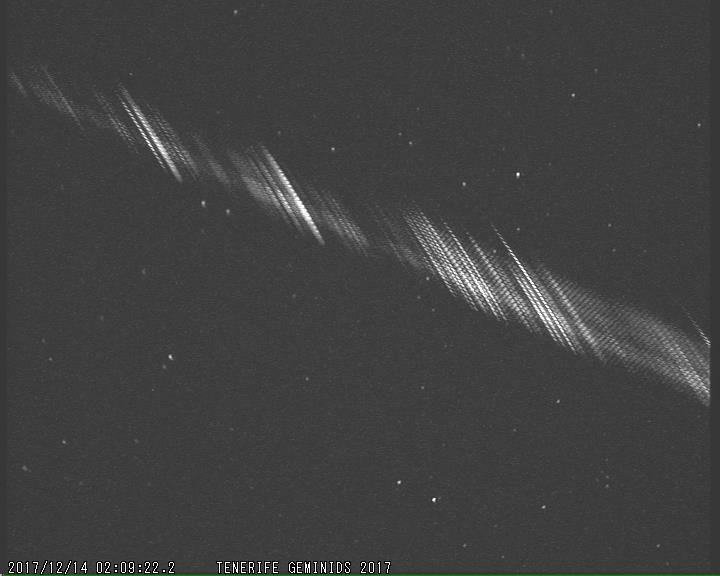 Of course you could catch a very bright meteor are get a fantastic spectrum with the high dispersion but they are not so common. The other regulars might have different ideas though. thank you very much for you reply! Unfortunately, I can have difficulties with acquisition of other lens, however I can increase focal length up to 8 mm. It is still not enough for receiving a good science spectra with 830/mm grating? Whether the distance between graing and the lens matters? If yes, please prompt how to choose it correctly. Your equipments are good, I think. The difference between 6mm lens and 8mm lens does not matter much. And the difference between 600lines/mm or 830lines/mm dose not matter, too. You should minimize the distance between graing and the lens. Start your observation quickly, because it may take time a little to get a good spectrum. Koji is right, you will need patience as it takes time to catch those rare excellent spectra. However with the cameras and lenses we have now it is easier than ever, even if you still need to wait a little while for success but you will succeed over time! I live in one of wettest and cloudiest parts of Europe (and probably the world!) so if I can get good results so will you. Make sure you post them here, I'm sure all the regulars would love to see your images and spectra. Of course, I will try to publish my results in this subject. Many thanks and clear sky! I have captured an excellent meteor spectrum in this morning. This is the best one in this year. That magnitude was -3.7 and the duration was 4.4sec. within the frame. It may be sporadic meteor from Eri direction. The Na line is stronger than the Mg lines, but the spectral type may belong to the normal type. this is a really beautiful spectrum. I think it would be woth analyzing it with my method of orthographic projection. The calibration could be extracted from the sodium lines of the actual spectrum itself, which eliminates errors by shifting grating position, focus etc. If you are interested, you could download the AVI file to Dropbox as for the earlier spectra. Maybe you could zip it to reduce it to a manageable size. Thank you for having interest and giving your help. I could not work your previous software well. I will send you the movie file. I changed the grating from 600UV to 600VIS, both made by Edmund. I have just spent an excellent three nights observing from Teide on Tenerife. There is now a lot of light pollution from the tourist resorts around the island but it has a great sky and at 2000m+ the view is still worth traveling to see. First, second and some third order overlap are all here. The geminids have very strong Mg and Ca lines. I have others that are much better (not so congested with overlapping orders) but I have so many it will take time to work through them all! A nice problem to have! Congratulations on Geminids expedition observation success. The spectrum is very good and has so many unsaturated lines. I can’t identify the spectral lines due to the overlapping orders of spectrum. It seems to be difficult to analyze. 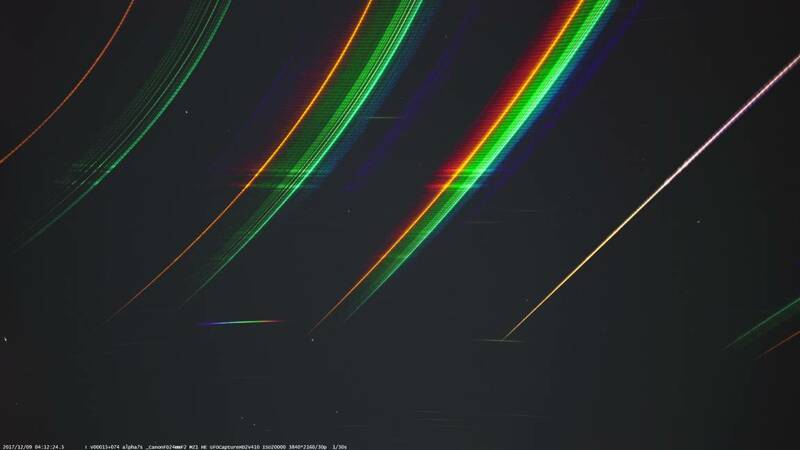 What camera did you observe for this spectrum? as promised, I send you the results of the analysis of your last spectrum. I determined the calibration parameters from the Na-lines. After subtracting the background, I transformed all images to the orthographic projection, as described in http://www.meteorastronomie.ch/images/20160605_Calibration_of_Meteor_Spectra_Dubs_IMC2016.pdf. More details are given here: https://meteorspectroscopy.org/welcome/documents/. As you can see from the resulting peak image, the spectra are linear with a constant spacing between Na-lines. After registering the meteor images I produced a little movie which shows the constant calibration as well. It also shows the separation of the meteor into several fragments towards the end. Thank you for sending me the original AVI file. It was a very succesful trip with over 30 spectra captured. Visually it was also an excellent display. I calculated the ZHR to be 128 +/-11. I used one of my WATEC 910 cameras with a 12mm f0.8 lens fitted with an 830 grooves/mm grating. Very compact set up and I used a laptop to run UFO Capture. 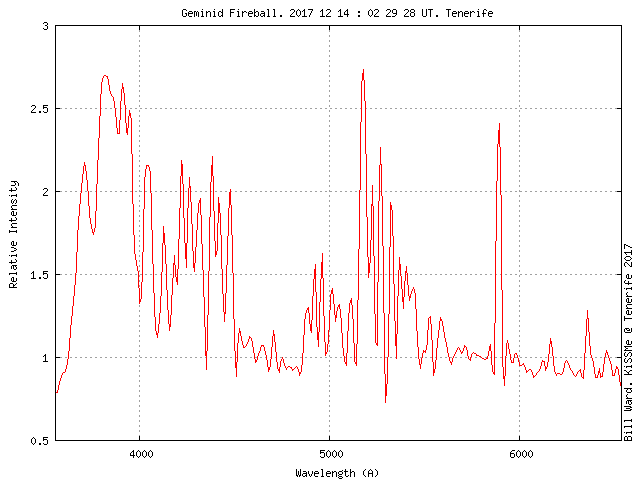 Below is a really good spectrum from another fireball. This one is unusual in that it has quite a strong sodium line. Modelling by Ryabova and Rendtel indicated the possibilty of the Earth encountering particles shed by Phaethon in 2009. These would be "fresher" and perhaps not have lost so much of their volatile contents. This spectrum might actually be evidence of that! I'll know more when I analyse more of the spectra to see if there are any other candidates. 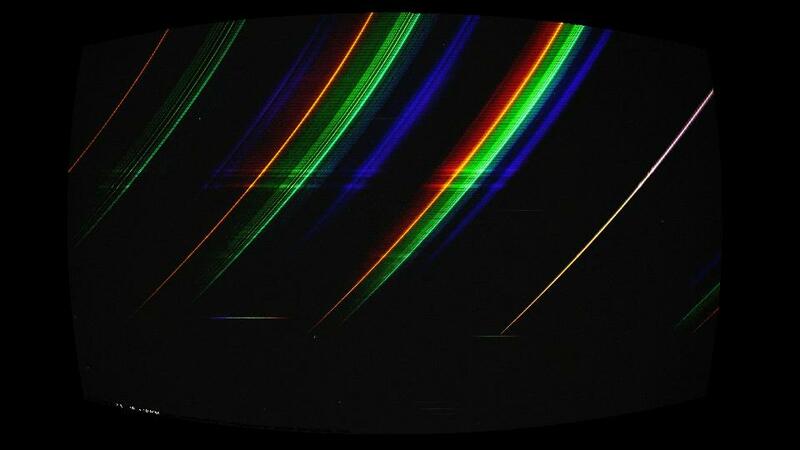 Another example of spectroscopy being the ONLY way to investigate the possibilities!